Basketball is a team sport played by two teams of five players on a rectangular court. The objective of each match is to shoot a ball through a Basket mounted on the backboard at each end. 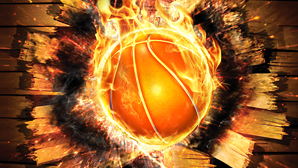 Basketball is one of the world's most popular and widely viewed sports, especially in US. The rules are simple: A team can score a field goal by shooting the ball through the basket during regular play. A field goal scores three points for the shooting team if the player shoots from behind the three-point line, and two points if shot from in front of the line. A team can also score via free throws, which are worth one point, after the other team was assessed with certain fouls. The team with the most points at the end of the game wins, but additional time is issued when the score is tied at the end of regulation. The ball can be advanced on the court by bouncing it while or running or throwing it to a teammate.